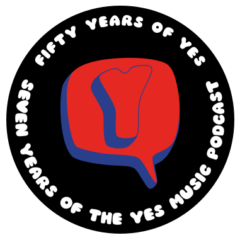 The one hundred and thirty third episode of the Yes Music Podcast, featuring live reporting and my thoughts on the amazing Yes concert at Symphony Hall in Birmingham on 4th May, 2014.
Who agreed to be interviewed? What was the performance like? The decent photographs above were taken by William Mulryne (I took the rubbish ones). @YesMusicPodcast @yesofficial @asiageoff What a great podcast – I really got the sense of excitement during the build up to the gig. @YesMusicPodcast Loved the podcast re-4th May. Brought back the atmosphere of that amazing concert. Nice one kevin! @YesMusicPodcast I enjoyed hearing about your concert experience. Reminded me of mine last summer. Excited for July! Hi I’m picking up VIP stuff from at Manchester on 10th May. Any tips? Go straight to the merchandise guys and ask when and where the VIP stuff will be available. The bloke who gives it out could be Paul Silveira, the tour manager but that could be wrong – I’m suer someone will put me right. Whoever it is he’s a nice chap – from US or Canada. He also looks after the meet and greet. I heard his talk before they went up all about not shaking hands with Steve Howe! Enjoy! Thanks for the comments! I intend to! What a beautiful venue to see the worlds greatest progressive rock band how fitting. Congratulations on a great show and I was able to follow a bit on 9012 live ..
Take care can’t wait till next week! Thanks so much, Paul. It was an absolute blast! I’ll let William know you like his photos – he is starting to get quite a bit of interest! Fantastic episode. Great to hear the “Live broadcast” and a whole bunch of different voices as well as the photos. Of course I didn’t get to hear this until a day after I saw Yes at RAH the following Thursday and it was quite spooky that you described Jon Davison in virtually the same terms as I had in my email to you (sent after you’d recorded the podcast, but before you’d published it). Fantastic work, Kevin. Keep it up.